Coaching Soccer in Canada: The importance of being yourself when you coach. Coaching Soccer in Canada, by Frank DeChellis . The importance of being yourself when you coach. In any activity where you are the leader in a situation such as coaching or teaching, a major part of your apprenticeship is being encouraged to "be yourself". Since 1988, I have been coaching non-stop and have done a lot of teaching. I even had a stint in politics. Even with all that exposure, the "be yourself" thing took a while to happen. Learning how to be yourself is a major part of your development in any profession or pursuit, including coaching. The major benefit of being yourself is that when things go wrong you are in a better starting position to steer the ship straight. If you are pretending to be somebody or something else, the real you will come out when the stress creeps up on you. If you keep jumping between who you really are and who you are pretending to be, your players will not know who they are dealing with. Once you start being yourself as a coach your sessions are easier to deliver, games are easier to manage, stakeholders are easier to deal with and you are more comfortable bringing your coaching education up to the next level. 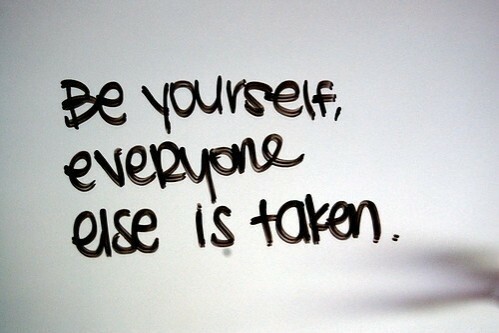 So how do we make that jump to "being yourself"? Well, first of all, don't start off trying to imitate somebody else. You're better to be a nervous "you" than a poor imitation of somebody else. When coaches hit the licensing stream in their coaching education, they occasionally make the mistake of imitating their instructors. Under the stress of being assessed, the real you will creep out. "If you keep jumping between who you really are and who you are pretending to be, your players will not know who they are dealing with." In the early going, coach what you know best. If the topic is very familiar to you then one major distraction is removed. Coach HOW you feel most comfortable. If you're the facilitating type, then let your organization do the coaching at first. If you were a very good player, then do a lot of demonstrating. If you are a delegator, then let your assistants demonstrate. Be over prepared and plan for as many distractions as possible. When you make the unexpected "expected", you are in a better position to deal with things as they happen. Less stress is always better. If you are not an experienced coach or player, take stock in what you bring to your program. If you are a teacher, you still bring a lot to the table. The same goes with a person who is self-employed. Or a home maker. Or truck driver. Or priest. Etc. Bring what you offer to EVERY session. It's difficult at first, but you must fight the urge to try and mould yourself into what you think the stakeholders on your team want to see. Every doctor doesn't try to be Patch Adams , nor does every priest try to be Father O'Malley. If you are not yourself, you will never achieve sustainable success as a coach because you are not becoming comfortable in your own skin. Yes, I said "never". Think about it ... how long can you possibly keep up imitating somebody or something else? The Difference Between Treating Players Equally and Fairly. Special Education, grassroots coaching and the youth soccer player. coachingsoccer.ca Frank DeChellis, Author. Picture Window theme. Powered by Blogger.